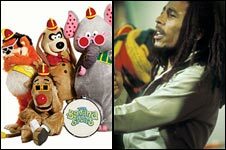 BBC NEWS | UK | Magazine | Did the Banana Splits inspire Bob Marley? Did the Banana Splits inspire Bob Marley? The children's TV classic the Banana Splits is getting a modern makeover, reviving memories of its sing-a-long theme tune. But have you ever noticed the startling similarity between it and Bob Marley's hit Buffalo Soldier? Listen to Buffalo Soldier - key lyric "Woy yo yo" - and The Tra La La Song, and it might seem like there is an echo in the room. The eight-bar passages are remarkably similar in tune and rhythm. But while the Banana Splits came onto the scene in 1968 as hosts of The Banana Splits Adventure Hour, Bob Marley & the Wailers' Buffalo Soldier did not appear until the posthumous release of Confrontation in 1983. So did NBC's costumed rock band of Fleegle the dog, Drooper the lion, Bingo the gorilla and Snorky the elephant influence one of the greatest reggae artists of all time - and if so, does it amount to plagiarism? According to the Bob Marley Foundation in Jamaica, the reggae legend would probably never have heard of the Banana Splits, let alone be inspired by them. Spokesman Paul Kelly says he is unfamiliar with the TV show, and nor has he dealt with other inquiries about the Banana Splits. Buffalo Soldier is "Jamaican style straight up," he says. "Ye man, it's reggae - it's got the 'one drop beat' of the bass guitar and drums. The Wo yo yo is just Bob Marley being creative, it is Jamaican slang, an exclamation, a joyful noise the Jamaicans make when they laugh at a joke." But musicologist says songs are "strikingly similar"
But he says the song has a serious message: "In America, the red Indians used to say the black people resembled buffalos because of their dreadlocks - so 'Buffalo Soldier, dreadlock rasta' - and the song is about them being 'stolen from Africa, brought to America, fighting on arrival, fighting for survival' about 400 years ago." But a musicologist, who asked not to be named for professional reasons, says the songs are "strikingly similar." The main differences are in bars two and six, where the timing and inflection in Buffalo Soldier is more jumpy and Marley sings with a groove, whereas the Banana Splits theme song is "straight". And in bars three and seven, a note is gained in Buffalo Soldier or omitted in The Tra La La Song. "The other difference is in bar four - where the final note goes down to a C in Buffalo Soldier but up to an E in Banana Splits. In bar eight they both go down." The issue of plagiarism rests to a large extent on whether Bob Marley had access to the Banana Splits' theme song, he says. If he did not, it couldn't be infringement of copyright as the law stands. "Then it would be a coincidence - and coincidences do happen." But if Bob Marley had heard the tune, "there is also always the possibility of subconscious recollection". BBC 1Xtra's DJ Seani B offers another possible explanation. "It might be that Bob Marley's producer, Chris Blackwell, morphed mainstream sounds from the era into his music to make it more catchy. There is no evidence of this, it's just a conspiracy theory." Having heard other Marley songs years before their commercial release, DJ Seani B says the originals versions were different. "There was a watering down from the real authentic reggae, which was more drum and basic, to a more commercial style which would appeal to the masses." And although Jamaican music draws inspiration from a wide spectrum of sounds - including country music and R&B - he thinks the cuddly cartoon characters would not have been on Marley's radar. "He was a serious man, I very much doubt that he would have heard of them."